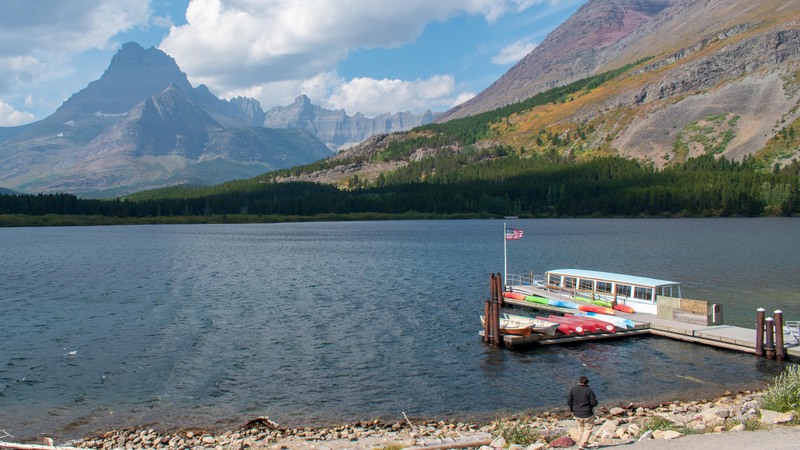 When a park is named Glacier National Park, that would be one of the best places to go and see a glacier, right? Wrong! 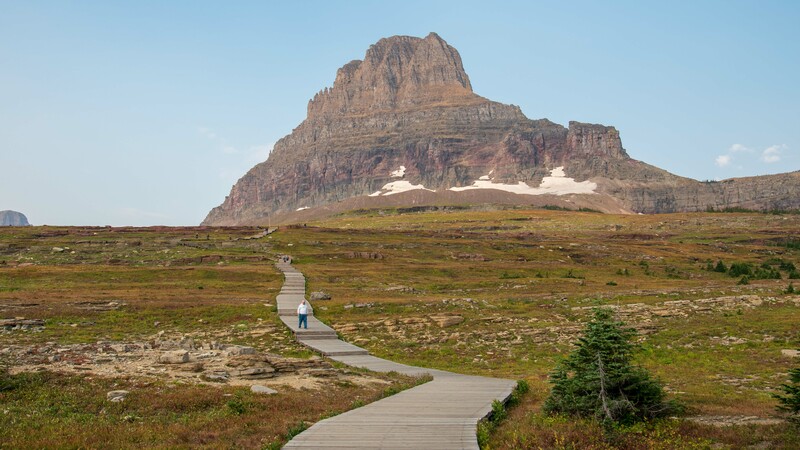 Glacier National Park was carved by glaciers, and it has a few glaciers left, but it’s not the best national park to see glaciers. Glacier Bay National Park, Kenai Fjords National Park and Wrangell St. Elias National Park, all in Alaska, are better places to see glaciers. 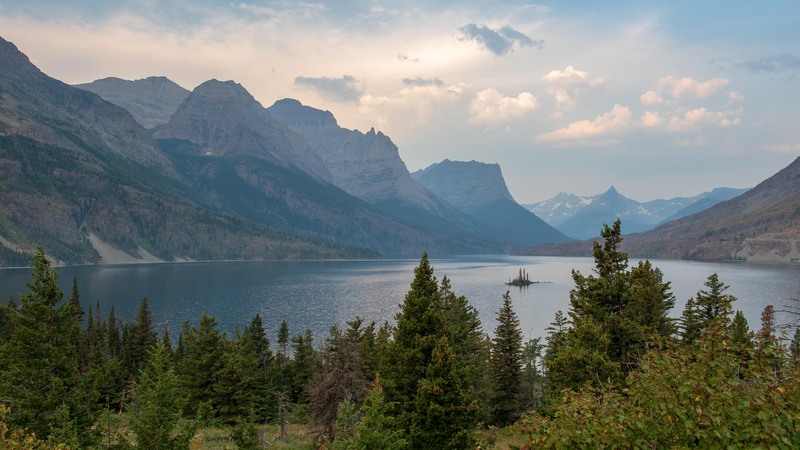 What does that mean for Glacier National Park? 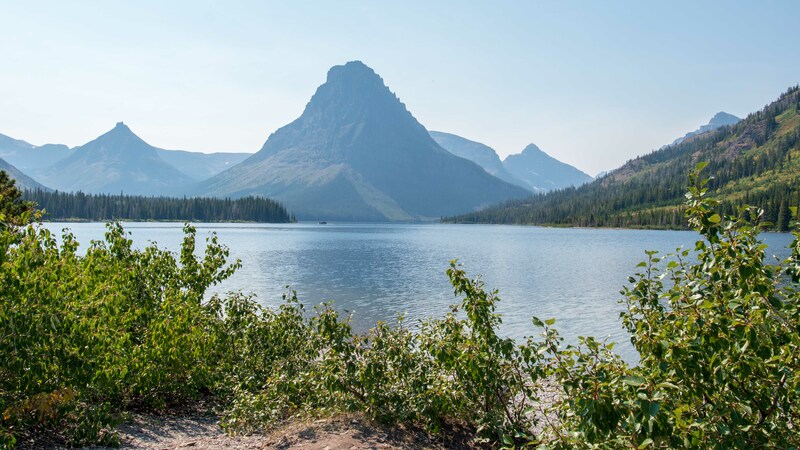 The name Glacier National Park is not about current glaciers, but it is about land carved out by past glaciers. The U shaped valleys, the jagged, thin mountains, and the wall formations are all evidence of glaciers past. There are 20 something glaciers in Glacier National Park now, but the size and number of glaciers are dwindling fast. There probably won’t be any glaciers left at Glacier National Park in 25 years. If glaciers are not that great at Glacier National Park, why do over 3 million people visit this park each year? Glacier National Park is simply a fun park to visit. It has something for everyone. 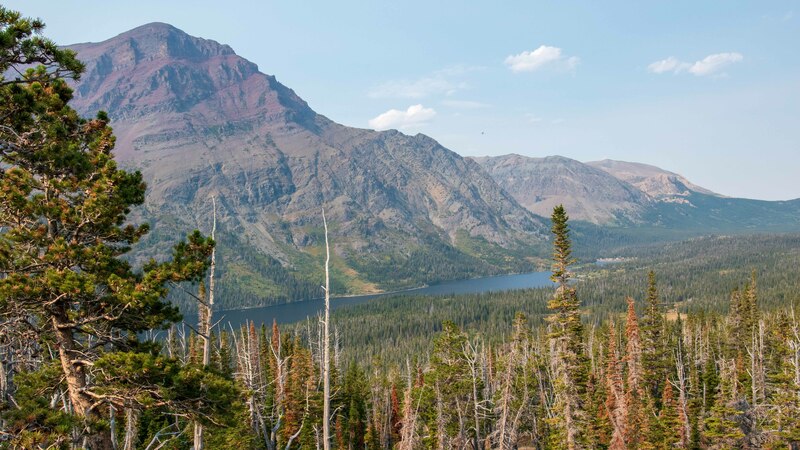 For those who are not very mobile, just driving the famous Going to the Sun road and stop at various scenic overlooks with the stunning mountain scenery is an excellent way of touring, plus the lake cruises at Lake McDonald, St. Mary Lake, and Many Glacier area are all very accessible. People who can hike moderate distances like us, there are many trails available, from flat walks less than a mile to four mile round trips that rise over 650 feet. For serious hikers, trails of more than 10 miles with thousands of feet of elevation gain to remote chalets are there for exploration, including a hike to a glacier. 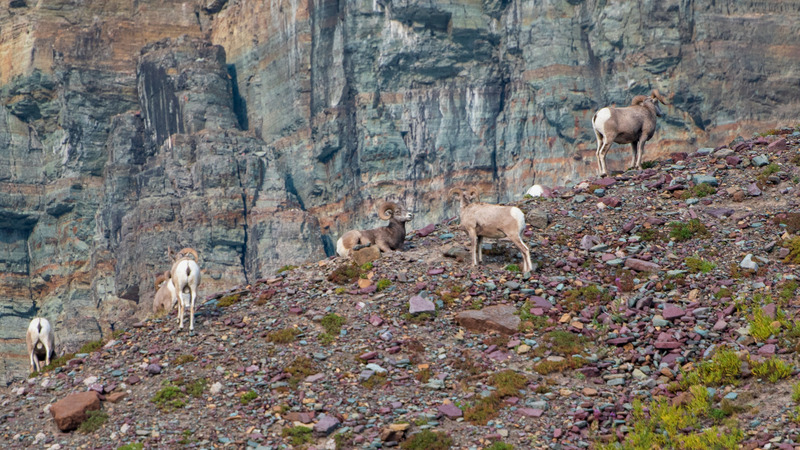 Wildlife enthusiasts take note: there are bighorn sheep, mountain goat, bear and many other wildlife. For boaters, there are lakes and scenic cruises. 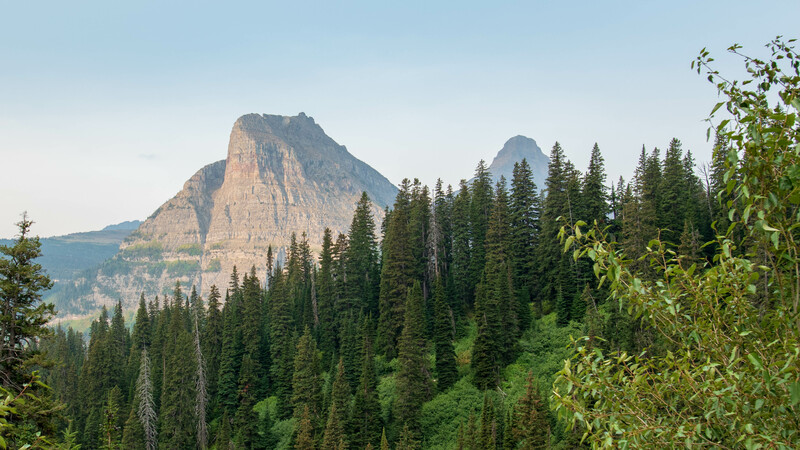 For train buffs, you can take Amtrak to Glacier National Park and watch the scenery as you get there. 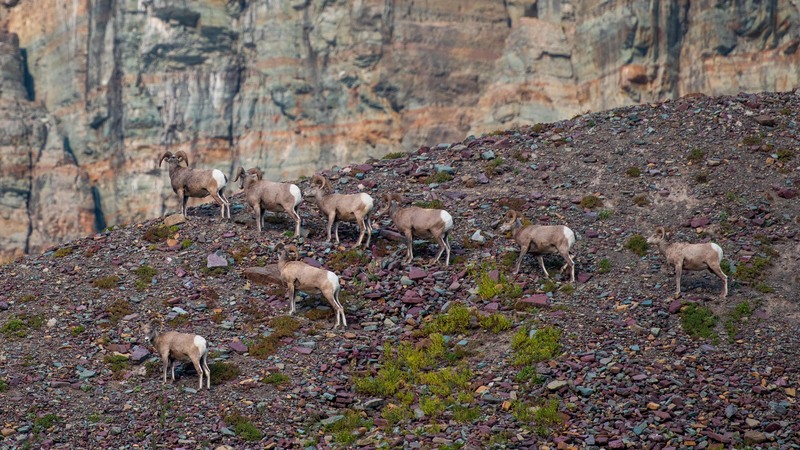 There is something for everyone at Glacier National Park. We carefully planned our trip for early September, after the peak crowds but before the weather turned cold. We flew into Kalispell, with its aptly named Glacier Park International Airport just outside of the park. The sky was hazy and the air had a tinge of smoke smell. We didn’t think much of it but that was a warning sign. By the time we got to the Apgar Visitor Center near Lake McDonald, the largest lake in the park, the air was thick with the smoke smell and the mountains were hardly visible. The visitor center was crowded with people in line to talk to the rangers. We got our Glacier National Park stamp and waited patiently in line with other mostly silver haired people. The silver haired ranger was extremely helpful but gave us the bad news that the entire western side of the park was closed due to the Howell fire, including 2/3 of the main park attraction – Going to the Sun road!! Loretta, ever the worrywart, asked about bears and what we needed to do to protect ourselves. 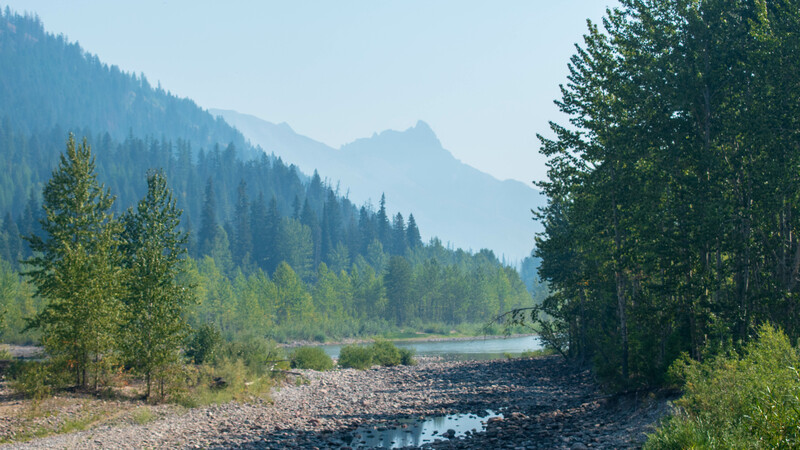 The ranger, in no uncertain terms, said there were lots of grizzlies and black bears and not only did we need to keep our distance, but we should also have bear spray. Of course, the next question was “where can I get bear spray” to which the ranger cheerfully said “right next to us at the gift shop”. That was the easiest sale ever made. We rationalized that we were going to be in Yellowstone and Teton next, so we’ll buy it here and used it in these other parks that were “bear heavy”. $45 later, we had our bright red can of bear spray. I thought some bells for $3 would have sufficed plus it will remind me of Christmas during our hikes, but the principle “happy wife, happy life” prevailed. For the rest of the trip, she was obsessed with bears! I wanted to see a bear, hopefully within 50 yards, at least close enough to get a nice picture with my 200 mm telephoto lens, but she only wanted to see them from 1/2 mile away! She dutifully read every last word of the instruction on the bear spray and played with it to make sure she knew how to use it. I tried to stay as far away from her as I can while she was doing that, in case she accidently triggered the spray. The ranger suggested the Two Medicine area to spend the rest of the day. Two Medicine is on the southeast part of the park with a lake and nice hiking trails. This was the main tourist area before Going to the Sun road was built. The trails ranged from 0.3 mile to a waterfall, to 7.6 miles to Pitamakan Pass. There were many trails on the other side of the lake that led to more mountain lakes, the trail head for which was accessible via a shuttle boat or a trail along the lake. The shuttle for the rest of the day was completely booked, so we decided to hike the Astor Park Trail, a 4 mile round trip to Astor Falls that ended with a beautiful view overlooking Two Medicine Lake, after a 650 feet climb. The vista at the overlook was beautiful but hazy due to the lingering smoke from the fire. The view of the lake in the foreground with jagged peaks and snow remnants in the shady areas on the side of the mountain was stunning. At the Astor Park overlook, a lady in “theme park crowd” attire, kept feeding a squirrel and kept saying how lucky she was to see wildlife and how cute the squirrel was. The squirrel would go all the way up to her, took food from her hand, and ran about 25 feet away to eat it. She repeated this many times. This was not good! We don’t want these animals to associate people with food, and become dependent on it! The Two Medicine area was not as well-known as other parts of Glacier National Park. We were very glad we found it, a blessing in disguise after the disappointment of missing the closed part of Going to the Sun road and the Lake McDonald area. St. Mary Lodge, just outside of the park boundary, was our home for the next three days. The lobby was nice with a roaring fire place. Our room, however, was in the basement of the main building and tiny, barely big enough to fit a bed and a dresser. The bathroom had barely enough room to turn around. This was the only room available when I booked 6 months ago, for “shoulder season”! Since we were going to be out most of the day and only needed a place to sleep, it was OK. The real challenge was the total lack of cell signal for AT&T in the area. The hotel WIFI only reached the lobby and was ultra-slow during peak times. We had to unplug for a few days! Not a bad thing but it served as a reminder how much we depended on technology. For example, I had to do route planning the old fashioned way – paper maps! Since the west side of the park was closed, I expected a lot of people on the east side. We got up extra early to avoid the crowd at Logan Pass, the end of the portion of Going to the Sun road that was open. Loretta was not usually an early riser, but she actually agreed and we set out shortly after daylight on a cloudy, almost misty day. The mountains were still hazy in the distance, affected by the smoke from the wildfire. Going to the Sun road ran along the shore of Upper St. Mary Lake with her turquoise color and thousand foot cliffs, with many pull outs to take in the gorgeous scenery. One such stop is Goose Island, a tiny island in the middle of St. Mary’s lake. The tall, glacier formed cliffs and the lake that was once a glacier produced dramatic reflections and shadows, which constantly changed as the position of the sun and clouds changed. Going to the Sun road climbed dramatically as it reached the end of St. Mary Lake and revealed more high peaks and jagged edges on the horizon. With the elevation gain, we were now looking down at the U shaped valley carved by the glacier, a beautiful sight. We made it to Logan Pass before 9:00 am and the parking lot was already 3/4 full. This was mostly the “national parks crowd”, all prepared with hiking sticks, boots, water, backpack, and often camera gear. Nearly all parties had at least one person with bear spray clearly visible and accessible in an emergency. These were my kind of people! Hidden Lake Overview, a 3 mile round trip, sounded like just the type of hike we like, so we embarked on the hike with many others, even at 9:00 am. The trail started with a wooden boardwalk that went up a meadow and climbed steeply and consistently. The relatively high altitude contributed to the breathlessness and frequent stops, but what a beautiful place to take breaks! The wildflowers in the foreground, flanked by tall peaks in the front and on both sides, made every stop even longer just to take in the awesome scenery. 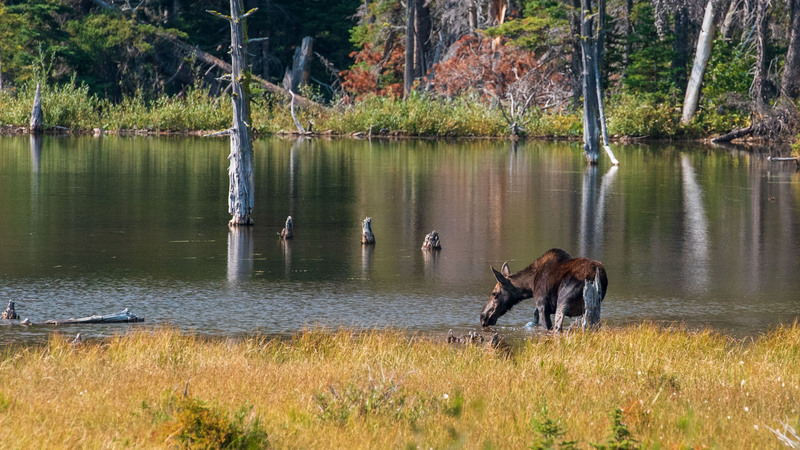 What is the best way to spot wildlife? Look for a gathering of people! Our hike to Hidden Lake was no exception. We saw a small crowd with fingers that pointed to the hills on the right where nearly a dozen big horn sheep lined up all in a row as if they were getting ready to march up a hill and over the ridge. Suddenly, the lead sheep turned around to face the second sheep, horn to horn. They butted horns a few times before the second sheep backed off and used his front hoof to dig up a dust cloud of dirt, and simply laid down as the rest of the sheep walked over the edge. What a scene! I had enough time, with my tripod assistant Loretta, to switch to the telephoto lens and put it on the tripod. This was exactly the situation for the fancy telephoto lens I rented for this trip. I snapped away with excitement. It was a beautiful day! The trail continued to climb, albeit more gentle now. Blue, red and yellow wildflowers covered the meadow with streams of water that flowed down the meadow between the flowers. A mouse darted between a hidden spot under a rock and the open area of the flowers, ever vigilant for predators. Picture a meadow full of colorful wildflowers, majestic mountain cliff on both sides brightly lit by the sun on one side but deep in the shadow on the other side. Directly in front were jagged peaks with snow in spots but hazy from the smoke. This was just one of the many dramatic and beautiful scenes at Glacier National Park.